How can I use MOVABOWL in my home? Simply move the disconnect lever to the unlock position and roll the mobile bowl to anywhere needed outside the bathroom. Then simply return to the docking station in the bathroom and flush away the waste. As I move the bowl from bathroom to another room, will water be spilling out onto the floor? No, the unique design of MOVABOWL has automatic valve systems that seal off the water and drain channels of the bowl preventing any leaking of water or waste. In addition, the toilet seat cover has a rubber seal that prevents any leakage of water sloshing around in bowl while in transit. How do you clean and care for a MOVABOWL? MOVABOWL is cleaned just like a standard toilet. You may also utilize blue tablets for additional odor suppression and sanitation just like you would in a standard toilet. You also have the option to take the bowl outdoors and wash with a water hose; unlike a standard toilet. Does MOVABOWL need a special technician or special installation? No, anyone that can install a standard toilet can install MOVABOWL without any special instructions, parts, or tools. 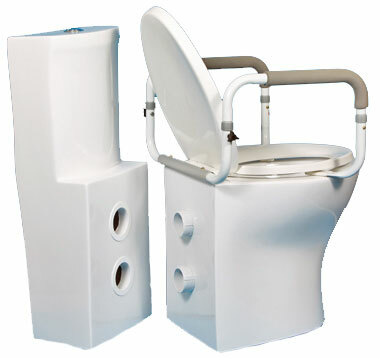 We have designed it so that it can easily replace any toilet bowl in any home or business. How does the MOVABOWL work when it is parked in the docking station in the bathroom? It works exactly like a standard toilet, no difference at all. There will be no disruption of other household members. However, if you install MOVABOWL in a shared bathroom, it may better to purchase an extra bowl so that the docking station always has a bowl to use while the other bowl is located in another location. Does MOVABOWL have an odor problem when being used? MOVABOWL should be used the same way a standard toilet is used. The sooner you flush away the waste the better. In addition, using chlorinated Blue tablets found in many stores can be utilized to help suppress odor. Keeping the toilet seat cover in the closed position will also help suppress odor. When possible, return bowl to docking station to flush. However, during the night if the toilet has been utilized several times, it is possible to wait until morning to flush the toilet without having an odor problem. It is possible to wait a few hours after use to flush because the water in the bowl is able to suppress odor for a limited amount of time. On occasions that the usage of the bowl causes an extremely high level of odor, it is probably best to flush immediately. Please let me know if you have any questions by phone or email.